What would you have taken as a pioneer on the California-Oregon Trail? This is your students' chance to find out first hand. Students on the Oregon or Bust! tour are assigned to actual families who traveled the Oregon-California Trail. They must calculate what to pack for their journey and then load their wagons with supplies. Red wagons with canvas tops and model-size boxes and bags simulate the experience. 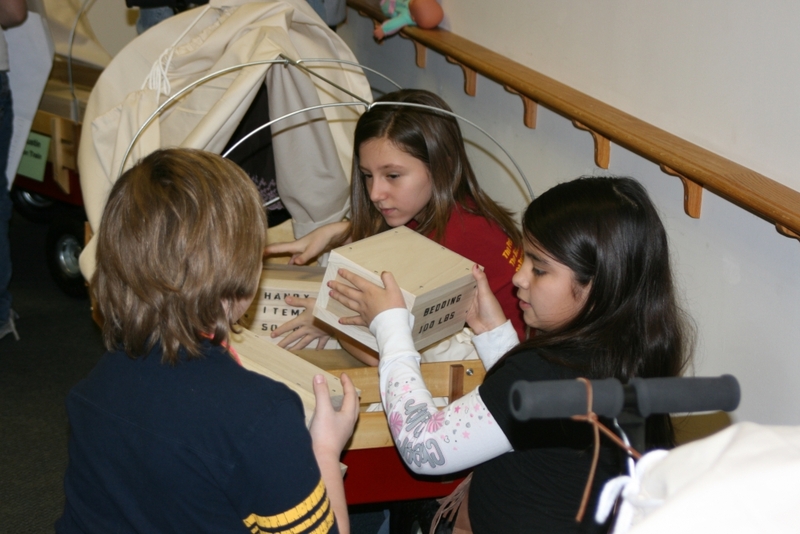 At the Kansas Museum of History students will explore the museum gallery, and then hit the (nature) trail. At stops along the way students learn about life on the California-Oregon Trail through primary source cards. They will gain or lose points based upon their group's skill in packing and preparedness. Will all groups make it? Only those families with the required amount of points can claim victory and begin their new life out West. This tour addresses Kansas grade specific standards. Teachers will receive pre- and post-visit materials to help prepare the students for the adventure. In the pre-visit materials is a lesson about the six families who actually traveled the trail. Also included are two Read Kansas! lessons--I-6 "Trade and Travel on Overland Trails" and I-7 "Life on the Trails". These lessons not only compare the Santa Fe Trail to the Oregon Trail but also give the students an opportunity to read primary source materials about two children who traveled the trails. The post-visit assessment piece involves journal writing. Note: This tour is designed to take place in the Kansas Museum of History and on the Historical Society nature trail. In inclement weather the tour will be conducted entirely within the museum facility. SL. 4.3: The student will identify the reasons and evidence a speaker provides to support particular points. W. 4.3 (a-e): The student will write a narrative to develop real or imagined experiences or events using effective technique, descriptive details, and clear event sequences. Length of tour: 75 minutes, with a maximum of one tour per two hour period. Registration and scheduling: Submit an online tour request, call 785-272-8681, ext. 414, or email kshs.education@ks.gov. Tours must be scheduled at least two weeks in advance.